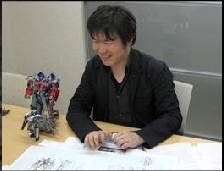 Disclaimer: This translation is provided solely to help non-Japanese fans who are unable to read this insightful interview published on Takara-Tomy’s website. The original is located here. – Firstly, which “Transformer/Revenge” (Japanese ROTF title) product did you develop? 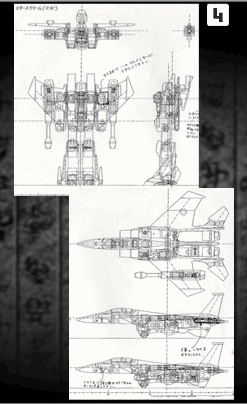 Hasui: Among the early lineup products, I was responsible for Starscream and Sideswipe. I did more in the later waves, but unfortunately I can’t show them yet. In the first movie, I was in charge of products such as Jazz, Barricade, Arcee, Ratchet and Starscream. Hasui: Haha, I am not sure if I am actually called that, but I do like Starscream character, so I often take him on eagerly. I have done Micron Legend, Super Link, Galaxy Force and Classics Starscream items. 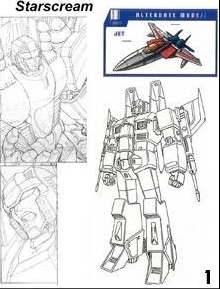 – From your point of view (as a Starscream specialist), what was the first impression of the (first) movie Starscream robot design? 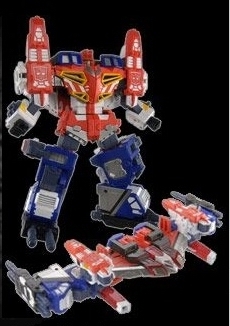 I think he was very different from Starscreams we were used to through cartoons and toys…. Hasui: Well, you are right, but I thought, “This one is right in its own way”. Because the first (G1) Starscream and Micron Trilogy (Unicron Trilogy ) Starscreams were all popular, but I had been making the same type of robots and did want to “create a new Starscream”. 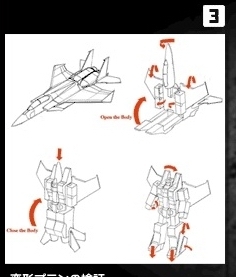 Thanks to the movie Starscream, I feel I created a different Starscream, in both proportion and the transforming process. – Did you get to watch the first movie before it was released to public? Hasui: No, I went to a theatre on the release day like the fans did, and there, for the first time, I saw Transformers moving in a live action film. The development of the movie and the toys were progressing almost at the same time, and we had to work only with still-in-progress design sketches of the front and the back of the robots. – Please tell us your candid impression of the first movie. Hasui: First of all, the joy of seeing the TFs moving around as if they existed in the real world. Even after leaving the theatre, I wondered if cars on the street were actually TFs, and that made me realise how TFs were suitable subjects for a live action movie. – Who is your favourite character in the movie? Hasui: Personally, I am looking forward to seeing Sideswipe in the upcoming movie. He has a robot mode which is close to the classic, cool robot Japanese people like, and he is my favourite, too. I would love to see him in action. “Transformation ideas are formed by ‘playing well'”. – Tell us about the toy producing process from the concept to the final product. 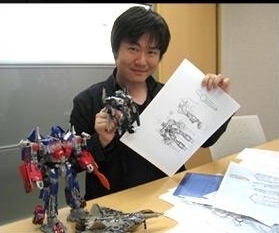 Hasui: Most of the transformable TF figures in the world are created by TakaraTomy. 7~8 designers manage to create 80 ~100 transforming robots annually. It takes about two weeks in average to form the basic plans of parts and transformation, gimmick and the basic design of both modes. It is indeed a battle against time, and the important factor is to get the interesting ideas constantly within the set time frame. Each designer has his own creative process, but I start from drawing front and side views in both modes (*picture2) based on an image illustration (*picture1). It is like when you stare a cloud and it starts to resemble something, I begin to see parts ideas when I stare a vehicle (mode image). I put those ideas together and make them into 2 transformable modes. I can’t lose parts, stretch/shrink them or change the tire size. Also, because they are toys, they need large enough pins and thick enough parts so that they won’t break when excess force is applied. Even after I figure out some aspects of transformation, it is still difficult to neatly complete the whole mechanism. Then based on that design concept, prototype manufacturer produces a transformable “Master” original model. Firstly, we draw rough transformation process sketches (*picture3) and check the process. 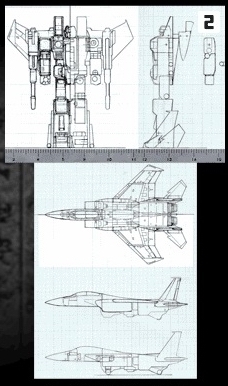 We polish the design up when there are problems in the proportion, size or transformation difficulty (*picture4). Each price range has the limit in parts numbers and weight, and we have to create products within this restriction. Bulky bodied robots such as tanks tend to be heavier and hard (to fit within the limit). In the old days, we could only work on 2D pictures and there was some uncertainty until an actual prototype was constructed, but nowadays we can be sure thanks to 3DCG models. We build a prototype according to this drawing (*pictureB), then we reflect this to the mould plan. – Were there any different challenges and hardships particular to the movie line? Hasui: The movie characters’ robot designs were done by DW beforehand and their vehicle modes had been already decided as actual cars from various manufacturers, and it was very challenging. If we could use original vehicle designs, it would have been possible to alter a vehicle shape to fit, but we could not alter licensed vehicle designs. So the balance between vehicle and robot (modes) was literally a matter of a millimetre. – There are some characters who were also present in the first movie, but the Optimus Prime toy has very different proportions and transforming process. Hasui: We thought of the point of releasing the same character twice within such short period. We had to present a distinct “evolution” so that the customers who bought the previous version will like to purchase this one as well. As for the second movie toys, we referred to CG characters created by DW and even watched the first movie frame by frame to make them closer to the perfection. But I don’t think it was possible to raise the quality without going through the development of the first Optimus Prime toy. 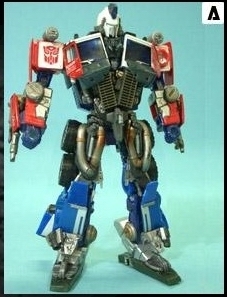 The new Optimus Prime has been created because the designers had more experience, and advanced their skills. – What inspires your new transformation ideas? Hasui: Playing well like young boys do. I can’t create fun things if I don’t feel right about the fun part myself. So I think it is good to be straightforward about “fun”, and be greedy in the pursuit of enjoyment. – Do you feel any difference between “TFs Western people like” and “TFs Japanese people like” designs? Hasui: I feel the vehicle designs Western people like are the ones whose appearances clearly show how they want to be perceived in what ways. Fast cars show the willingness for the fast running in their designs, and you can tell apart the ones with strength by a glance. I think Japanese people like to focus on the functions and accessories in vehicle designs. Not the vehicle shape itself, but more on the armaments and how functional they are. The same thing can be said for robot modes, in the West, powerful type robots have obvious bulky and masculine build and speedy type robots are apparently slender and agile. These “characteristic ways” are quite evident in American comic heroes. I think Japanese people tend to be particular about how powerful the weapons are, or how the ability get improved with armaments. There is a base body, and the each characteristic is shown by how various optional parts are added. In Japan, the “drill” weapon is popular, but that suggestion doesn’t seem very acceptable in overseas, and I recognise the above mentioned difference as one of the reasons. – It seems to reflect the “national characteristics”. Are there any differences in the choice of popular characters in the West and Japan? Hasui: Bumblebee, who played many active parts in the first movie, is popular both in America and in Japan. Main characters are always popular, of course. In America, characters like Megatron or Starscream, who are the villains yet have the cool “Dark Hero” characteristics are also popular. In Japan, the good guys Autobots are the popular ones. It might be due to many of them having familiar alt modes, or the influence from cartoons and samurai dramas which traditionally feature “the good defeats the evil” kind of moralistic storyline. As for the villains, I hear Barricade is popular among children because of his cool police car vehicle mode. – Did the toy development staff offer ideas for the characters and their designs to the movie staff? Hasui: There is no direct communication to the movie staff. It is more like we form a tag team with Hasbro, and send our suggestions through Hasbro. We do not suggest a character selection, but we did suggest that combiners could be the key in the second movie. Hasbro had the same opinion, so we sent the idea to the movie staff as a common suggestion from the 2 companies. 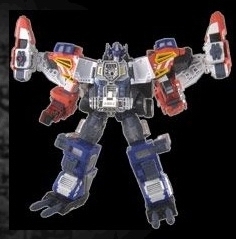 This “Combiner” idea is reflected on some new characters in the second movie. – Did the movie staff, such as the director Michael Bay, actually get to play with the movie toys? Hasui: I am not sure as there’s no direct communication to the movie staff. But the gimmick that Barricade ejects Frenzy from his chest was meant to be for the toy only, so I was surprised to see it happening in the first movie. I would be really happy if they could be inspired from the toys in “Revenge” as well. – What is the first TF you had your hand in its development and eventually made it to the product lineup? Hasui: Not a product released domestically, but it was a toy only character from overseas “Beast Machines” series, Skydive. He was a pteranodon TF. I remember that my then trainer handed me a single sheet of pteranodon drawing and said, “Do anything you can do to make this thing into a cool looking robot!”. – What is your favourite TF out of the ones you developed? Hasui: I am afraid I can’t show it to you here, but my favourite is always “the one I am currently working on”. Even right after having completed a product I am fond of, I try to better it in my next project. As a developer, I always want to think the next product is the best one yet. That is why my favourite TF is the one I am working on right now. – Which TFs gave you a hard time developing? Hasui: Combiner items are usually difficult. Especially the figures which come out in later waves to combine to the ones released earlier. I recall Wing Saber (Super Link) was exceptionally difficult. I liked my idea of a unique style of combination, that it would be fun if (Wing Saber’s) limbs could be swapped around and combined (to Grand Convoy) either way. But to realise it, there were many hurdles to go over. The combined form (Wing Convoy) needed to be taller than Grand Convoy, but it exceeded the weight limit. 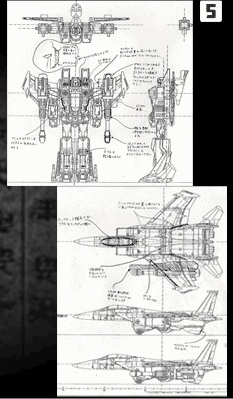 (Wing Saber) needed to be lighter, had to have vehicle and robot modes of his own, then he was supposed to turn into limb parts which could be used for scramble combination….I was at my wit’s end with those conditions. Then when I finally cleared those conditions with much contrivance, it didn’t fit inside the package! Especially with the products which are also sold overseas, package sizes are strictly set according to the price range, so we can’t make the box bigger just because the product is slightly larger than it’s supposed to be. As I mentioned earlier, the restrictions of the size, weight and cost are always with us. – You seem to have endless stock of stories about hardship! 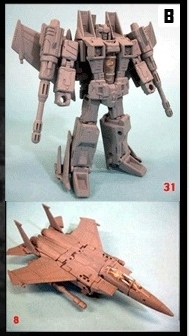 Well, without considering the realisability of making it into an actual merchandise, what do you “want to transform”? Hasui: I would like to transform an actual car, of course. TFs are beings with mechanical bodies, and they disguise as humans’ machines, so I want to see cars and motorbikes with real working mechanism automatically turn into robots. That’s my ultimate dream! – Finally, please send your message to TF site viewers. Hasui: Transformers never stay the same, and they keep on advancing. Please look forward to their future!